One of the greatest explorers of the Age of Discovery, Ferdinand Magellan is best known for leading the first expedition to circumnavigate the globe. However, he personally did not complete the route and perished in the South Pacific. A determined man, he overcame personal obstacles, mutinies, uncharted seas, biting hunger, and malnutrition during the course of his voyage. Today, his name is synonymous with discovery and exploration. Fernão Magalhães (Ferdinand Magellan is an anglicized version of his name) was born in approximately 1480 in the small Portuguese town of Villa de Sabroza. As the son of the mayor, he led a privileged childhood, and at an early age, he went to the royal court in Lisbon to serve as page to the Queen. He was very well educated, studying with some of the finest tutors in Portugal, and from an early age showed an interest in navigation and exploration. As a well-educated and well-connected young man, it was easy for Magellan to sign on with many of the different expeditions departing from Spain and Portugal at the time. In 1505, he accompanied Francisco De Almeida, who had been named Viceroy of India. De Almeida had a fleet of 20 heavily-armed ships, and they sacked settlements and established towns and forts in north-eastern Africa along the way. Magellan fell out of favor with De Almeida around 1510 when he was accused of illegally trading with Islamic locals. He returned to Portugal in disgrace and offers for him to join new expeditions dried up. Magellan was convinced that a new route to the lucrative Spice Islands could be found by going through the New World. He presented his plan to the King of Portugal, Manuel I. He was rejected, possibly because of his past problems with De Almeida. Determined to get funding for his trip, Magellan went to Spain. Here, he was granted an audience with Charles V, who agreed to finance his journey. By August of 1519, Magellan had five ships: the Trinidad (his flagship), Victoria, San Antonio, Concepción, and the Santiago. His crew of 270 men was mostly Spanish. Magellan’s fleet left Seville on August 10, 1519. After stopovers in the Canary and Cape Verde Islands, they headed for Portuguese Brazil. Here, they anchored near present-day Rio de Janeiro in January of 1520 to take on supplies, trading with locals for food and water. It was at this time that serious troubles began: the Santiago was wrecked and the survivors had to be picked up. The captains of the other ships attempted to mutiny. At one point, Magellan was forced to open fire on the San Antonio. He reasserted command and executed or marooned most of those responsible, pardoning the others. The four remaining ships headed south, searching for passage around South America. Between October and November 1520, they navigated through the islands and waterways on the continent’s southern tip. The passage they found was named the Strait of Magellan. They discovered Tierra del Fuego as the sailed. On November 28, 1520, they found a tranquil-looking body of water. Magellan named it the Mar Pacífico, or the Pacific Ocean. During the exploration of the islands, the San Antonio deserted. The ship returned to Spain and took too much of the remaining provisions with it, forcing the men to hunt and fish for food. Convinced the Spice Islands were only a short sail away, Magellan led his ships across the Pacific, discovering the Marianas Islands and Guam. Although Magellan named them the Islas de las Velas Latinas (Islands of the Triangular Sails), the name Islas de los Ladrones (Islands of Thieves) stuck because locals made off with one of the landing boats after giving Magellan’s men some supplies. Pressing on, they landed on Homonhon Island in the Philippines. Magellan found he could communicate with the people, as one of his men spoke Malay. He had reached the Eastern edge of the world known to Europeans. Homonhon was uninhabited, but Magellan’s ships were seen and contacted by some locals who led them to Cebu, home of Chief Humabon, who befriended Magellan. Humabon and his wife even converted to Christianity along with many of the locals. They then convinced Magellan to attack Lapu-Lapu, a rival chieftain on nearby Mactan Island. On April 17, 1521, Magellan and some of his men attacked a much larger force of islanders, trusting their armor and advanced weapons to win the day. The attack was fought off, however, and Magellan was among those killed. Efforts to ransom his body failed. It was never recovered. Leaderless and short on men, the remaining sailors decided to burn the Concepción and return to Spain. The two ships managed to find the Spice Islands and loaded up the holds with valuable cinnamon and cloves. As they crossed the Indian Ocean, however, the Trinidad began to leak. It eventually sank, although some of the men made it to India and from there back to Spain. The Victoria kept going, losing several men to starvation. It arrived in Spain on September 6, 1522, more than three years after it had left. There were only 18 sickly men crewing the ship, a fraction of the 270 who had set out. Magellan is credited with being the first to circumnavigate the world in spite of two somewhat glaring details: first, he died halfway through the journey and second, he never intended to travel in a circle. He simply wanted to find a new route to the Spice Islands. Some historians have said that Juan Sebastián Elcano, who captained the Victoria back from the Philippines, is a worthier candidate for the title of first to circumnavigate the globe. Elcano had begun the voyage as master on board the Concepción. There are two written records of the journey. The first was a journal kept by an Italian passenger who paid to go on the trip, Antonio Pigafetta. The second was a series of interviews with the survivors made by Maximilianus of Transylvania upon their return. Both documents reveal a fascinating voyage of discovery. The Magellan expedition was responsible for several major discoveries. In addition to the Pacific Ocean and numerous islands, waterways and other geographic information, the expedition also sighted a great many new animals, including penguins and guanacos. The discrepancies between the log book and the date when they returned to Spain led directly to the concept of the International Date Line. Their measurements of distances traveled helped contemporary scientists determine the size of the earth. They were the first to sight certain galaxies visible in the night sky, now aptly known as the Magellanic Clouds. 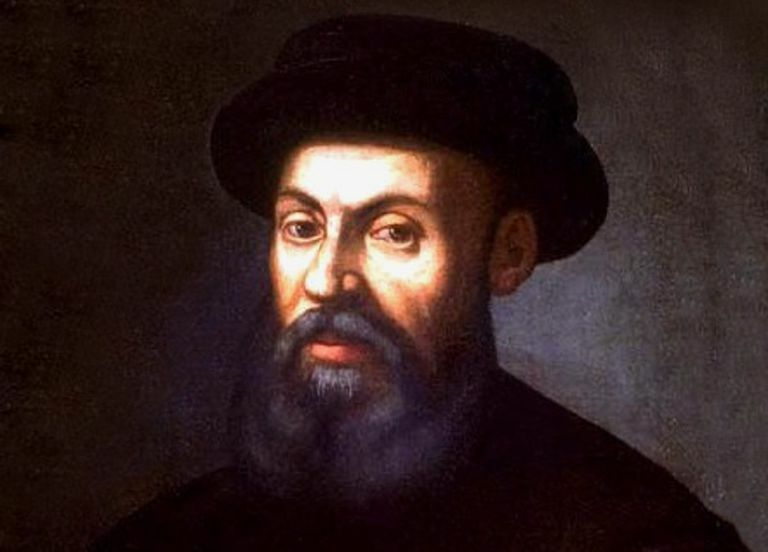 Although the Pacific had been first discovered in 1513 by Vasco Nuñez de Balboa, it is Magellan's name for it that stuck. Balboa called it the "South Sea." Immediately upon the return of the Victoria, European sailing ships began trying to duplicate the voyage, including an expedition led by surviving captain Elcano. It wasn’t until Sir Francis Drake’s 1577 voyage, however, that anyone managed to do it again. Still, the knowledge gained from Magellan's voyage immensely advanced the science of navigation at the time. Today, Magellan’s name is synonymous with discovery and exploration. Telescopes and spacecraft bear his name, as does a region in Chile. Perhaps because of his untimely demise, his name does not have the negative baggage associated with it like fellow explorer Christopher Columbus, blamed by many for subsequent atrocities in the lands he discovered. Thomas, Hugh. "Rivers of Gold: The Rise of the Spanish Empire, from Columbus to Magellan." Paperback, Random House Trade Paperback, May 31, 2005.